There are very few things worse than handing over your keys to a stranger and praying they take care of your car and don’t stuff it into a wall or, y’know, a Subaru. The struggle of valet parking is something I’m sure we all have to deal with on a very uncomfortably frequent basis. Thankfully, auto company Daimler and electronics and appliance maker Bosch have teamed up to solve this problem. Automated valet parking doesn’t seem like a necessary component of automated driving—but it could very well make parking in general a lot easier in a utopian (or dystopian, depending on your opinions) future where cars can safely drive themselves. Aside from traffic jams and obnoxious drivers, parking in a relatively populated area is one of the most frustrating aspects of driving a car. Not only do you have to find a freakin’ place, cruising up and down parking structures with eagle-eyes only to find a single open space that you can’t even squeeze into because the two folks on the other side both parked like assholes, but then you have to worry about other people parking like assholes in the event that the original assholes move. And then you have to hunt it down when you’re done. Daimler and Bosch? They get it. They feel your pain. A year ago, they teamed up to start working on an aspect of automated driving that hadn’t been considered before. They started working on automated taxis in California. Now, they’ve opened up the first automated valet parking lot in Beijing, China. Basically, the idea is that you don’t have to park your own car, and you don’t have to trust someone else to do it. You just have to let your car do its own thing. 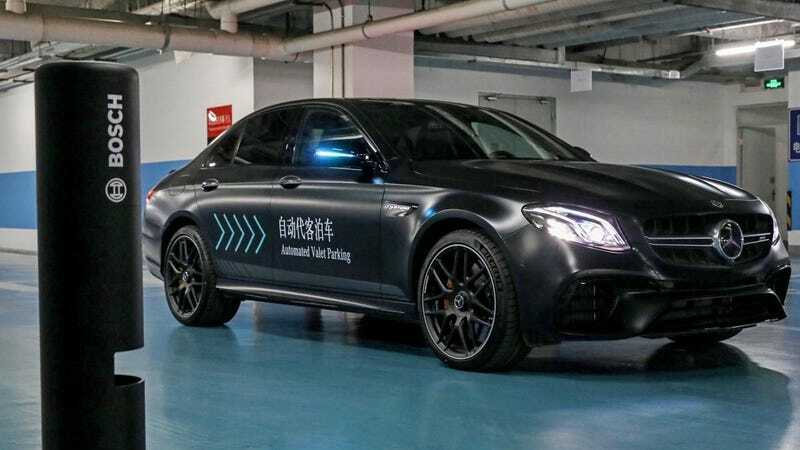 Say you have an automated car and you just so happen to be in Beijing. To use this new bit of technology, you just need to park your car in a designated drop off area. You then use a smartphone app to send the car off to park itself. The parking lot is decked out with an intelligent infrastructure that will be able to register any vehicle in the area. Motion sensors in the car park can both monitor everything happening in the lot and can also be used as the guide for the car, which has to be equipped with the onboard technology to allow it to be registered. So, no, this is not some fancy automotive magic that’ll work on just any ol’ car. Once the sensors detect your car, then it’s hands-off: the car scoots away to an assigned parking lot. When you’re ready to pick it up again, you just head over to a pick-up area, tell your app you’d like your car back, and voila: there it is. Magic. Automated Valet Parking is another new endeavor for Bosch and Daimler to strive for ‘accident free, stress free and emission free’ future mobility. Automated Valet Parking makes manually parking a thing of the past and helps vehicle owners to save time and ease stress. This pilot also demonstrates Bosch’ transformation into a mobility service provider in close collaboration with our long-term strategic partner Daimler in the Chinese market. Given the fact that automated technology is still in its early stages—and that not everyone agrees to its introduction—it could be a while before this migrates to the rest of the world. Personally, I kind of like driving cars, but I could readily accept an automated parking lot to save me the hassle of navigating horrific city parking situations. Parking may not necessarily be the first thing you think of when you talk about driving—but it is a pretty essential part of the vehicular experience. Daimler and Bosch are ahead of the game.